"Are you talking about me? I'm not a bad dog, honest." I am rarely reluctant to write about my dogs, but there's something I've been trying to pretend isn't happening - hoping it'll pass. I am very worried about Tess. I have never met a dog like her before. I have never seen this behaviour. Have you? I've made an appointment at the vets tomorrow. It will help clarify my thoughts if I catalogue Tess's story. 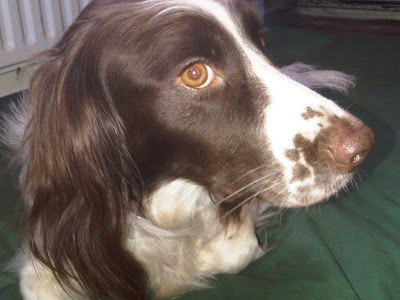 Tess is an elegant, shorter-eared working-type English Springer. She came to us from Dogs Trust when she was nine weeks old. We'd gone along for the opening of one of their refurbed centres and there she was, seemingly with our name on her! My soon-to-be husband Graham had previously had Welsh Springers. I had been Beardie-less for about a year after the last of my oldies died. We were ready to adopt. We virtually had to wrestle her from Dermott O'Leary's arms - he'd come to re-open the centre - but a week or so later, when she finished her vet checks, she came home with us. She had a strange unexplained little hole in the top of her head. There was some confusion as to her history, the dog warden said she was found running along an A road, but a kennelmaid at Dogs Trust had originally told us she was found in Tesco's car park - hence us calling her Tess. She was a perfect little pup, very quick to learn and gentle. Affectionate and willing. We used the Dunbar method on her, took her everywhere. She was a little star and was loved by all the family. But I noted that if you raised an arm anywhere near her - to get something off a shelf for example - she flinched. A year later Oscar the Beardie pup came along and completed our doggie family. They quickly became firm friends. So much so that Tess saved Oscar's life by rescuing him from our pond when he toppled in. They played like littermates together, rolling over, chasing, mouthing each other. Sometimes it got quite loud and intense. But while Tess was the obvious leader, they never tired of each other's company. To this day they play this way. When Tess reached a year old we had her spayed as that was part of the agreement in having her from Dogs Trust. Nothing significant happened for a long time and the only odd incident I can think of in that time was the first time Tess saw Barney, our office cleaner. Barney is a big chap with a beard and he would make a great Father Christmas. Tess was on a lead and she jumped up at him barking, which was odd. He's a very gentle, softly spoken fellow. The next strange thing to happen could potentially explain things - or could just be a red herring. About two years ago I fell suddenly very ill. I was talking to my GP on the phone as the symptoms began to worsen and she told me to go immediately to hospital and offered to call an ambulance. I said I didn't need an ambulance and while I was home alone when I was speaking to the GP, I was confident my husband would return quickly and take me. He quickly added that Tess had bitten him but it had been quite understandable as they had made a lot of noise making a forced entry and they'd had to smash our double French windows. They had patched things up as best they could and made secure the damaged doors. They wanted to find me to make sure I had made it to hospital safely and to give me the key to the padlock as they'd had to smash the lock! Tess had obviously been terrified as we had never known her to bite before. I was in hospital for another eight days so by the time I came home Tess seemed totally back to normal. Nothing spectacular happened and life returned to normal and I got better, which was lucky as the prognosis had been terrible! A few months ago, while Cameron my younger step son and I were sitting quietly at the kitchen table doing homework, we were to see a strange side of Tess. Tess was sitting at his side and every now and again he'd reach down and pat her in between maths questions. Without warning Tess made a fearsome noise and butted him with her closed teeth on the side of his head. It hurt and there was a red mark, but Tess was instantly back to herself as if nothing had happened. I examined every bit of her to see if something was sore and Cammy had touched a painful area without realising. But there was no reaction no matter how hard I pressed. We all forgot about it as we couldn't explain it. A few weeks later the exact same thing happened again. Reluctantly I told the children not to pat Tess anymore, that she was unreliable. Around this time some other strange things started to happen. Tess has always been an escape artist and a lover of chasing rabbits and birds. But when she went native there were now times when she seemed to have no idea who we were. She'd previously been very responsive to the whistle. But now it varied: sometimes she would come bounding back wagging her tail and sometimes she would look straight through us as if she didn't know who we were. She'd come back on her own eventually, looking delighted to see us and very much the old Tess. She stopped being as successful at catching rabbits, too. She still loved to chase them, she just didn't catch them anymore. I also noticed that when Oscar barked excitedly, Tess would sometimes make a very odd noise, more like a wail than a howl or a bark. I'd never heard a dog make that noise before. It was un-dog-like. If that noise was odd, the day she saw the plasterer who had come to work on the office was really disturbing. He wasn't your typical builder. For a start he cleaned up afterwards and brought his own Green Tea! 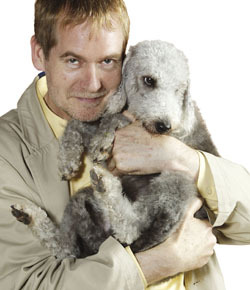 He was bald, not very tall, very clean, quietly spoken, gentle and dog friendly - being a Golden Retriever owner. In no way an obviously intimidating man. Yet, as Tess saw him approach the house for the first time she let out a terrible scream. We all assumed she'd trapped her feet under the door and that she was in agony. It was a blood curdling noise. Her eyes were wild, her heart was thumping. I checked and she hadn't hurt herself - there was nothing obviously wrong with her. The plasterer came straight in and patted her and everything was fine. Again I hoped - maybe it was just a one off. Perhaps he reminded her of someone. She'd welcomed every other visitor to the house up until then - apart from the policeman who was in full uniform. Then on a day when Tess had run off after a rabbit and had had one of her forgetting who we are moments we saw another weird piece of behavior. In the tree line at the edge of the field was a twitcher or a plane spotter - it's hard to tell the difference - we're next to a small airfield. He was a tall man with a beard and he was standing quite still using binoculars. He was nowhere near Tess, yet she once again let out her blood curdling scream and started growling and going well... nuts! She threw herself on the floor and was inconsolable. Last week Chloe who works on the magazine was in the kitchen boiling the kettle when Tess asked for a pat and a fuss. Chloe has been brought up with dogs. She was patting Tess and as usual Tess went on her back offering her belly for a tickle. Suddenly, without any obvious warning, Tess flew at Chloe making her mad noise - but she was quick and got out of the way. Seconds later Tess was asking her for pats again. Today was the final straw. I couldn't pretend to myself any longer that we didn't have a serious problem. Luke who works for me was patting Tess in the office, I'd nipped over to the house to find something and was only gone a few minutes. When I came back I could sense a tense atmosphere. Tess had been asking for pats and then she'd suddenly flown at Luke and butted him in the face with closed teeth. It had hurt and she'd broken the skin. Poor Luke was already feeling fragile as he'd had a nasty car accident the night before. Within seconds Tess was asking him to pat him again as if nothing had happened. I had to face it, there is something serious going wrong with Tess and I have to take action before she headbutts someone who will take action or does more serious damage. I'd already asked a canine neurologist and a behaviourist for their hunches and they both said get referred, check everything out. We'll needs loads of tests to fill in all the blanks as there's no stand out answer to why she's turned into a Jekyll and Hyde dog. Thank god she's insured with Pet Plan. Jemima Harrison asked if I'd considered Fucosidosis, which I hadn't. But that's something we can blood test for hopefully and get a quick answer to. And it's been suggested as she's a working type and quite fine boned - maybe she's got some Cocker blood - could this be Cocker Rage? So tomorrow we start at the beginning with the vet. I've already confessed all to the receptionist and it does feel like something to be ashamed of. My dog is attacking people without seemingly any provocation. I guess we rule out the physical first and then we get referred to a behaviourist. She's also recently started being odd with Oscar. She'll suddenly fly at him for no obvious reason and just knock him over backwards. He's a very gentle dog and rarely protests but it takes him by surprise. Plus she's not just not catching rabbits, she's not as good at catching treats as she used to be. My hunch is it's physical. Her gums looked quite pale after she'd lunged at poor Luke. She's such a lovely young dog - most of the time. I am dreading what we might discover once we start looking. But I also dread not finding anything to fix as it's going to be very hard coping with this behaviour if it continues to escalate. Sorry barrie, I must have typed Setter by mistake - we're doing Irish Setters this month in the mag. She's an English Springerish, I guess. Although sometimes I think she does have a look of a very small Irish Red and White. I am so, so sorry for you Beverley. It must be awful for you, and so worrying. I hope the vet finds some relatively simple physical cause. Certainly fear seems to be a factor, at least on some of the occasions, which makes it sound neurological. Perhaps that old hole in the head holds the answer. I'll be thinking of you tomorrow when you take her to the vet. Please let us know how she gets on. I know when I had all the problems with Jez (my staffy) it was a real help to be able to 'talk' to people on the internet about it. Worrying with you! Hoping it is something easily sorted. The hole? Perhaps a foreign body? Will be watching avidly for news. Positive thoughts winging their way across cyberspace. Fingers, toes and springer paws crossed here for positive news. Oh dear, and she sounds such a lovely dog! I do hope some reason can be found. It does sound like the Jekyll and Hyde symptom of cocker rage but let's hope it's something physical that can be put right. Sorry I can't offer any help for this, I just wanted to offer my support. None of this is your fault, you have done everything you can for your girl and I am sure will continue to do anything that helps her. I thank the heavens that it was you that plucked her from the Dogs Trust that day and that in itself is in her favour. Fingers and paws crossed that this is quickly remedied. Hi Beverley, So sorry to hear about Tess. You must be so worried. Loads of us will be thinkng of you all tomorrow - best of luck. I would also say neurological - especially as it seems to be getting worse over time. The hole in her head could potentially explain it a bit as well. Do let us know the result though. I'm so sorry to hear that Tess is not well. I know exactly how you feel as you are describing behaviour that is exactly the same as my cocker spaniel exhibited (although in her case it was directed at our other dog rather than people), right down to the strange, scream-like noise she's making. In our dog's case it turned out that she had Addison's Disease and her behavioural turns were mini-crises (has Tess developed any strange tremors at all or had any muscular weakness?). if you haven't already you might want to get Tess checked out for it (if that's what it is it is very controllable with medication - certainly our spaniel is doing brilliantly). I can tell you that the "fits" have not responded to psych drugs tried by the owners' vets, or the cure has been worse than the disease. Fucosidosis I had never heard of -- apparently it is rare in this country, more common over there. Can anything be done for it? So sorry to hear about this. Putting your dog on a pedestal? Children reselling rescue dogs - what next?